CHANTILLY, Va. – Air Force Major General Susan K. Mashiko was honored for contributions she made to the U.S. Air Force and the intelligence community during her 34-year career in a retirement ceremony held on July 25, at the National Reconnaissance Office (NRO) in Chantilly, Va. Hundreds of Mashiko’s colleagues filled the NRO auditorium to give the former deputy director of NRO a memorable sendoff. Former Secretary of Transportation Norman Mineta, who sponsored Mashiko to attend the U.S. Air Force Academy, was among the attendees at the ceremony, which was officiated by Director of National Intelligence James R. Clapper Jr.
Mashiko was awarded the National Intelligence Distinguished Service Medal “for her tireless support to the intelligence community during a period of unprecedented challenges” and the Defense Superior Service Medal for 34 years of meritorious service. She also received a White House Certificate of Appreciation “for devotion to duty and a spirit of sacrifice in keeping with the proudest tradition of the military service,” and a personal letter from President Barack Obama that highlighted the general’s patriotic devotion to duty in times of peace and war as inspiring, and said that this devotion spoke volumes about her commitment to serving her country. These awards join a long list of Mashiko’s awards, including the Legion of Merit and the John J. Welch Award for Excellence in Acquisition Management. In her remarks, Mashiko said she decided to remain on active duty for as long as she found her assignments challenging. She went on to say she never encountered a boring day. She was thrilled to receive projects that senior analysts judged were impossible to achieve. Mashiko expressed appreciation to the people who helped her during her career. Born in Glendale, she entered the Air Force as a graduate of the U.S. Air Force Academy, where she earned a bachelor’s degree in aeronautical engineering. She received master’s degrees in national resource strategy from the Industrial College of the Armed Forces and in electrical engineering from the Air Force Institute of Technology. Her career has spanned a wide variety of space and acquisition assignments, including chief of the Programs Division in the Office of Special Projects, executive officer to the Department of Defense Space Architect, and Director of the Evolved Expendable Launch Vehicle System Program. 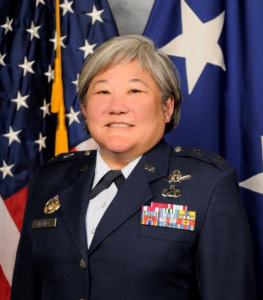 She has also served as the program executive officer for Environmental Satellites; commander, MILSATCOM Systems Wing; and vice commander, Space and Missile Systems Center. Prior to her current assignment, she was director, Space Acquisition, Office of the Under Secretary of the Air Force, Washington, D.C.